Affiliate Links: I may receive a small commission if you make a purchase using a link below. If you’re new around here, you may not know that Twitter is my favorite social media platform. I created my first Twitter account 7 years ago in college. It was definitely not the account I use now, but was one I specifically for school. We would have Twitter Chats (before they were called that) and live tweet some of the material we watched during class. We were even graded based on participation. Now I use Twitter largely as a marketing platform for myself and my blog. I don’t always have as much time as I’d like to be able to chat and participate. Yet even when I’m not at my desk or have my phone handy to be tweeting, I’m still “there.” When I started blogging, I started a brand new account with no followers. Slowly in a year and a half, I’ve grown my following and finally feel more confident in my “Twitter Routine.” Here’s how I’ve done it. 1. Schedule posts in advance, so even when you’re away, you’re really not. Consistency is key, and I personally love Buffer to help me do this. When I went on vacation in January, I had scheduled out the entire week I was gone plus some extra. You can use Buffer for free for 10 posts at a time, or it’s $10 a month for 100 posts. I also like that Buffer has suggested posts to help me on days when I’m a little low on content to share. Admittedly I don’t participate as much as I would like to, but these are a great way to get connected with new bloggers and creatives. For fashion bloggers, I love #StyleChat (Wednesdays, 12pm PST). For creatives, there is #CreateLounge (Wednesdays, 5pm PST). For beauty bloggers, try #BeautyChat (Fridays, 11am PST). 3. Tag people, but tag them correctly. In this instance, Old Navy was trying to have a conversation, but because they didn’t space the username properly, their entire audience saw this customer service fail. Oops. 4. Check your analytics to see what your followers really like. By keeping up with your analytics, you can see which tweets are most favorited, retweeted, and clicked on. You also can get some information about your followers, like their main interests, their general age range, location, and gender. Not surprisingly, 87% of my followers identify as female, 8% are from Seattle, and their interests include shopping, fashion, and beauty. 5. Have a genuine conversation! Twitter is all about engaging and chatting… well, in 140 characters or less! But that’s my favorite part of it – asking questions, getting answers and building friendships. 6. Utilize photos when sharing blog posts. I, like a lot of others, are visual people. When I see an interesting photo, I’m much more likely to click on your tweet, and thus click on your link. I always try to include a photo when possible with my tweets. The beauty of Twitter is quickly and easily sharing others content. Love an article about Gilmore Girls? Tweet it out! Tag the author, and you’re sure to put a smile on their face. 8. Use hashtags when appropriate, but don’t get too crazy. 9. Most of all, have fun. Twitter shouldn’t be taken SO SERIOUSLY all the time. Having fun and tweeting quips, silly PSAs, and dumb stuff your dog/kids/SO did is important too. I follow you on Twitter because I like you and I want little sneak peeks into your life outside of your blog. 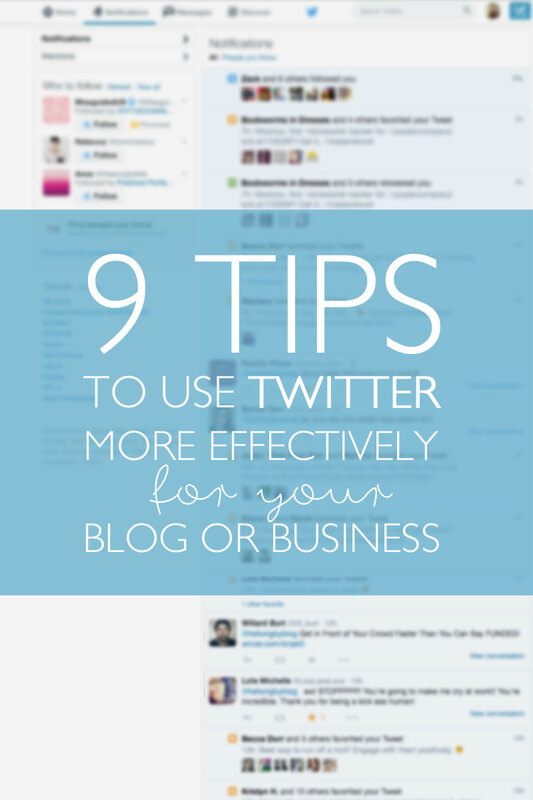 What are some of the ways you’ve been using Twitter for your blog, yourself, or a business? I’d love to hear about it! I say Hootsuite works fine, too! Hootsuite is my life saver, otherwise I would be a major fail on Twitter. I need to be better about joining in on some Twitter chats. I’m fairly new to Twitter and had NO idea it made a difference how you tagged other people so… THANKS! These are some great tips! Thanks for explaining the period before the username thing…I’ve always wondered! Ugh I’m so not on top of my game with Twitter! I really just starting using it a few months ago and I still don’t post everyday. These are great tips, thanks for sharing! Haha, you’re welcome! I just grabbed things that were close at the time in my timeline (so first thing in the morning, then right before I published!) Apparently you’re just popular on the Twitter. ;) Yes, the tagging thing drives me crazy too, and honestly was the inspiration behind the post. I get so tired of seeing it happen over and over so my hope was to shed some more light on that! I’ve also started seeing the URL thing more often too! So weird! I love this post. We can all use a refresher course on proper use of any social platform. I just learned that whole period before tagging deal. It makes such a huge difference. I wouldn’t consider myself a total expert on Twitter, but I always cringe when I see businesses mis-tagging things or putting someone’s handle at the beginning of a tweet when it shouldn’t be. It’s just one of those little things that bugs me, like when people use the wrong version of your/you’re in a sentence. Neither do I, but I do cringe at that too! It always shocks me how many people seem to not understand the concept! Whoa, imagine my surprise at seeing my tweet up there. Haha! :) But absolutely useful information. I started using Buffer recently (signed up a long time ago, but like seriously started buffering things yesterday). Trying to make it a consistent habit. Haha! It was just conveniently there on my timeline when I was finishing up this post. ;) Buffer is awesome and has helped me so much with consistency! I’m just getting back into the twitter game and this was beyond helpful. Thanks so much! I love these tips! And this is so timely. My social medium of choice is Twitter, and I love that I’ve met so many people and got access to so many networks and resources through Twitter. This was a great read! I also love your tips on tagging, which I see a LOT of confusion around. Great post, Jenn! Yes! These are great tips! I have only done one twitter chat so far since becoming more involved with twitter, but I loved it and really need to find the time to get into it more! Thanks Chelsie, glad you liked the post! I user to participate more frequently in chats, but a lot of them happen during my commute home which makes it challenging! You can find Twitter Analytics at http://analytics.twitter.com if you’re logged in. Sorry, went back and linked that! Yes, you can use the suggested tweets for free, but they do count towards your limit of 10 at a time! Ha, wow, very similar points indeed! My main goal in writing this post was to touch on the tagging – it’s something I see done incorrectly so often and just drives me crazy! Loved your post too! It always bugs me when someone tags tweets wrong… especially when they are trying to promote my content or something, haha! Love these tips! I didn’t even know Twitter chats existed haha. Twitter is definitely my least favorite social media, I feel like I’m bad at it. I’m going to have to use your tips! thanks for sharing. I wish I had time for Twitter parties. They always seem to happen when I am away at my day job. Bummer! I know what you mean – most of the creative chats are at the end of my work day or are during my commute home! Super bummer. I love twitter but admittedly dont use the one for the blog as much as I should. Love these tips though! Wait. I don’t get why you need a period before tweeting at someone…? I hope I’m not being slow. I typically just start my tweet @hellorigbyblog.